There's a new 2018 Nokia 6 from HMD Global, candidly being called the Nokia 6.1. It's a nod to release versions that will put a smile on the face of the technically minded, as HMD looks to do right by this plucky mid-ranger. 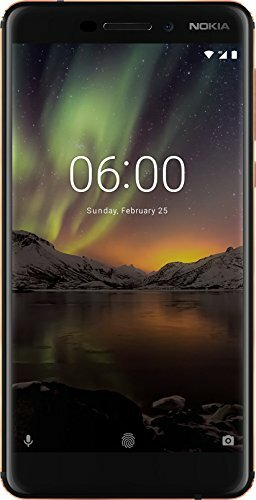 The 2017 Nokia 6 had a strength in design, clearly punching above its weight to deliver on Nokia's heritage of endurance. Those viral 3310 videos and the playground jokes about those old Nokia phones lasting forever is something that Nokia's new guardians are keen to exploit. But perhaps most impressively, HMD Global seems to have digested the feedback on the Nokia 6 and made the Nokia 6.1 into something special for a phone of this price. Evolutionary is a fitting description for the Nokia 6.1: it doesn't shift the display to an 18:9 aspect ratio like many 2018 phones do, and there's no hyperbole about deep mineral finishes within a glass back, or anything such else. Instead, the story remains familiar: Nokia 6.1 starts life as a solid block of aluminium and it's carved out, giving strength throughout the body. You can feel that too; there's substance and solidity to this phone. It's a phone that feels like it will take a drop... but we wouldn't want to scar its anodised exterior. Where Nokia is applying detailing is in the "diamond cut" edges, exposing a contrasting colour to highlight elements of the design. Our black sample reveals copper detailing, but it's well measured and not kitsch like some previous attempts at this method have been. The industrial finish does leave slightly sharp edges - it's squared rather than rounded - and if we had to bet on an area where this phone would attract wear, it's likely to be on those angled, hard edges. There's also no IP rating for water-resistance, if we had to find another criticism. Overall, however, the Nokia 6.1 shows-off exceptional quality for a phone that's priced £229. This was once the realm of plastic devices, but now, thanks to the likes of the Nokia 6 or Moto G6, you're getting pretty much the same build quality as flagship devices. It's in the hardware that you're getting a lot for your money and where the Nokia 6.1 really raises itself beyond some of its rivals. The Snapdragon 630 hardware under the hood moves this device from entry-level hardware and into the mid-range. It means there's sufficient power to deal a little better with more demanding tasks. While basic daily functions run well enough on low-power hardware, Snapdragon 630 gives this phone a little more bite - especially at this price. Compare it to the Moto G6 and the Nokia is a step ahead, only the yet pricier Moto G6 Plus is on the same level. We've been using the Nokia to play PUBG Mobile, the game du jour, and while it won't play at such high settings as you'd get on a flagship Snapdragon 845 device, it's still perfectly playable. The inclusion of microSD makes for easy expansion of the 32GB internal storage too. The 3000mAh battery isn't the most capacious, but it does now come with fast-charging (a significant failing of the 2017 Nokia 6), so you'll be able to top it up quickly. It will still last you through an average day pretty well, but this is where you will find that some of those more intensive tasks will really put demands on the battery. Still, for the average user, it will serve perfectly well. Overall, the Nokia 6.1 hits a lot of sweet points: it has the power, it has the flexibility, and doesn't scrimp on features like having a 3.5mm headphone socket. Essentially, you're getting a lot for your money. If there's a weakness it's in the speakers: one speaker on the bottom is easily covered, so you're advised to use headphones. Nokia hasn't fully-embraced the 18:9 aspect ratio like some manufacturers, instead offering that on the Nokia 7 Plus. So the Nokia 6.1 has a conventional 16:9 display and, therefore, bigger bezels compared to the new Moto G6 or the Honor 7C. For an LCD display the quality is pretty good. The colours aren't too forced, but the auto-brightness can be a little unadventurous, so it will occasionally need a nudge to get it to the right place for the conditions. There's a night mode/blue filter for those wanting to reduce strain in the evenings and this can leave you with some red smearing on scrolling, but not to the extent where it's a problem. Keeping things simple, there's a single camera on the rear of the Nokia 6.1, offering 16-megapixels. No dual or triple cameras to be found here. Despite an f/2.0 aperture, low-light photos can be a little poor. In dim conditions the slower capture will lead to blurring, there's image noise, and the camera is pretty slow to focus too. In good light things are more positive, although the HDR (high dynamic range) skills aren't as apparent as leading phones, but at this price we can accept that. High contrast can confuse the camera, so it's well worth tapping to make sure the focus and metering is right for your subject. There's a manual mode you can access with a swipe of the shutter button - we like that mechanism - and you can then control various settings, importantly ISO sensitivity, focus and shutter speed for more composed shots. However, we'd rather that more attention was given to making the menu easier to navigate - we can't seriously believe that anyone will use these manual options as they are. For the front 8-megapixel front-facing camera there's the additional treat of a bokeh mode and the option to toggle a beauty mode on or off, as well as change the strength of the effect. This can give some nice results in good light. There's also the option for "bothies" - a split screen capture from the front and back camera at the same time - as well as picture-in-picture, which can also be applied to video for those instant social videos where you need to have your face in the action too. Talking video, the Nokia 6.1 also offers 4K video if you want it, as well as live video direct from the app to Facebook or YouTube. So there's a lot in this camera, but it also feels like it could be a little faster and more refined overall. Accompanying the launch of Nokia's 2018 phones was a significant announcement: Nokia is joining Android One. That might have slipped under the radar of regular everyday customers. What does that mean? It's really just a label saying that this is pure Google Android, without unnecessary bloatware and additions to the operating system. Nokia isn't changing the settings, it's not fiddling around with things, it's just giving you a stable and solid software experience. Many other manufacturers re-skin the software to "own" the experience, as you find from Honor, or pre-load some applications and sponsored content, such as HTC. Nokia does neither - it's only added a support app and tweaked the camera to suit its hardware. Nokia has also promised that this means fast updates as they become available. That, naturally, remains to be seen, but Nokia's track record here is very good: it updated 2017's phones to Oreo faster than just about any other maker, including security updates, and that's not to be sniffed at. It puts Nokia in a strong position. The display, perhaps, could have moved to an 18:9 aspect ratio for a more contemporary feel, and we think there's room for improvement around the camera experience (which also misses out a bokeh mode, which is all the rage at present). Apart from these minor criticisms, for £229 you're getting a lot of phone for your money. It's not just the generous hardware that makes a difference here, with Full HD screen and mid-range Snapdragon platform, but when you put this Nokia phone down on the table, it's a solid, good-looking device that shows the brand has found its form once more. Once the darling of affordable phones, the latest Moto G6 is about the same price as the Nokia 6, offering rivalling build quality, but with a dual camera on the back. You might value the addition of the portrait-mode skills, but it also has an 18:9 display. The Moto's big failing at this price point is that it sits on lower-power hardware, meaning it's a little slower in daily use - the more powerful (and more expensive) G6 Plus is more on the Nokia 6's level. Honor has been shaking things up at the affordable end of the smartphone spectrum for a number of years. The Honor 7X is a little more expensive than the Nokia, but it adds dual cameras, an 18:9 display and more storage. While it doesn't offer the pure Android software approach that Moto and Nokia will boast about, its EMUI re-skin does come with some useful additional features.